Today, August 22, 2018, the National Telecommunications Commission of Honduras (abbreviated CONATEL in Spanish), delivered radio communications equipment to COPECO, donated by ITU for emergency communications. 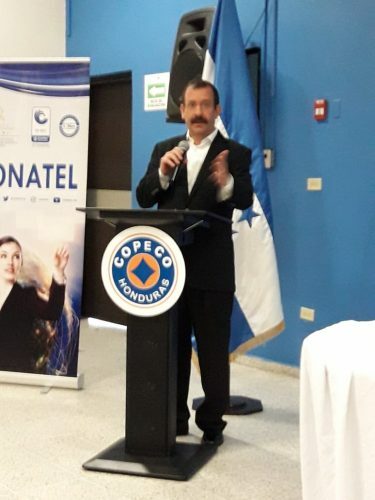 Lisandro Rosales, National Commissioned Minister of COPECO, stated that “one of COPECO’s objectives has been the strengthening of information and communication technologies (ICTs), and thanks to them, the institution has one of the most powerful communications networks of the region, with coverage of 95% of the national territory”. Omar Paredes, HR1OP, secretary of Club de Radio Aficionados Central de Honduras (CRACH), commented: “This program and radio equip0ment will allow first responders that work during emergencies to send information through radio waves in high-frequency (HF) bands, when telephone and digital communications collapse or if there are power outages”. Photograph 1: Dr Paredes, HR1OP, second from right to left, with authorities from COPECO, and CONATEL. 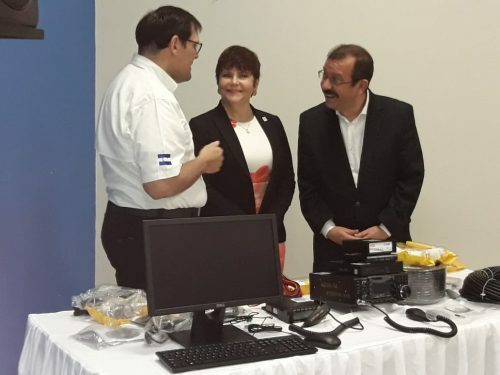 Photograph 2: From Left to Right: Lisandro Rosales, Minister National Commissioner of Copeco; Nelly Patricia Gaekel, Commissioned President of CONATEL; and Miguel Alcaine, Representative for Area D of Region 2 of ITU. Photograph 3: Miguel Alcaine, representative of ITU for Area D.